Tata Docomo is also India's first private operator to launch 3G services in India. 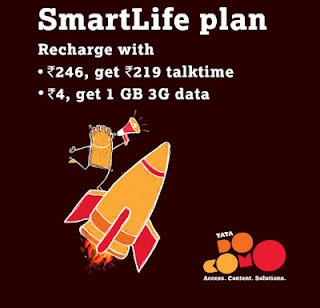 In a race to provide affordable 3G services for the consumers, Tata Docomo has introduced a special offer under their 3G SmartLife plans. Tata Docomo now offers 3G services for as less as Rs 4! Tata Docomo users can now buy a special recharge of Rs 4, in addition to a Rs 246 recharge to get 1 GB 3G Data usage in addition to the talk time! This 1 GB free 3G data usage will be valid for 30 days. Note: The special recharge should be bought within 48 hours of buying the Rs 246 recharge to enjoy this benefit. This offer is completely optional and subscribers can also recharge for Rs 4, independent of the recharge for Rs.246 & get free 4MB 3G data for 3 days! To buy or know more about this offer you can visit this link.